Some real estate tycoon once said, “There are three things that matter in property: location, location, location.” I don’t doubt the wisdom of that. But I would add that location also matters when it comes to video games. Critics are fond of saying things like, “But the city/dungeon/countryside where the game takes place is the real main character.” Sounds like hyperbole theater to me. Until it’s not. I bet you cannot only name where the last Elder Scrolls game takes place, but you can identify different Nord cities based on their architecture, different climates that range the landscape, and where you might find giants herding their mammoths versus where long-tusked horkers gather in family packs. I also bet you have a pretty good idea of where Marvel’s Spider-Man slings his webs. Or where the first Assassin’s Creed takes place, or Black Flag, or where the newest one, Odyssey, happens. You can name those things because, like that real estate tycoon informed us, location matters. When you can name those traits above about Skyrim, or you know that Peter Parker cracks wise through the streets of New York City, and that Assassin’s Creed has been everywhere from the Holy Land to the New World to the Greek Islands—that’s when you know you’ve encountered a game where the location is one of the main characters, if not the main character. 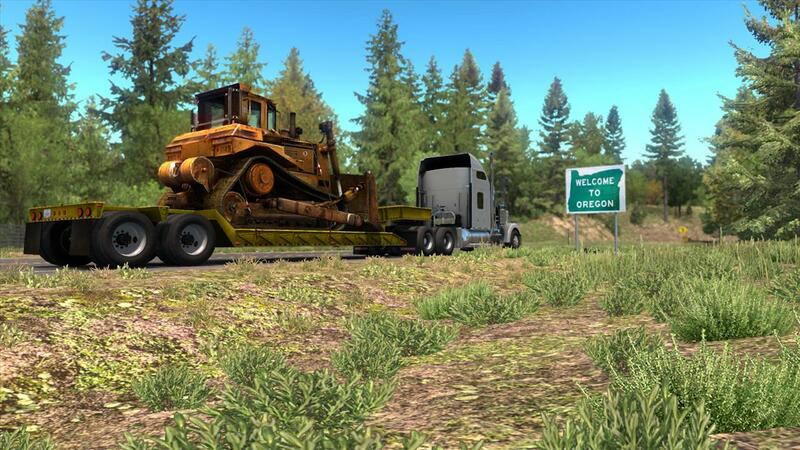 Well, I’ve encountered another one of those types of main characters in American Truck Simulator–Oregon. The name of the main character is right there in the title, too. I’m a native Oregonian, born and raised. The military took me as far in one direction as Japan, and my wife took me as far in the other direction as Washington D.C. But Oregon is home. I wonder, do people in your state have those rear windshield stickers that are an outline of your state with a heart in the middle? Those are called “Heart in Oregon” stickers here. And boy, do Oregonians love their Heart in Oregon stickers. In case the Oregon license plate doesn't tip you off as to where we live, we have lots of decals to really drive the point home. I’m sure your state does, too. My grandpa was a trucker. Sixty years. Was a long-hauler his entire adult life, after he was done being a foot soldier in the U.S. Army, that is. Sixty years trucking, though. One day he was having a heart attack while driving. He safely pulled his rig over to the side of the road, finished having his heart attack, and then pulled back onto the freeway to wrap up his route once it was safe to do so. He did decide that was his last load, though. Nonetheless: mad respect, Grandpa. I like 18-wheelers. I was too shy as a kid to pump my fist at a trucker to get them to honk their air horn. But I admire the trucks' power and beautiful lines. They look like bull elephants on parade, sound like freight trains on wheels. I also admire the mental fortitude a long-haul trucker has to have in order to even do that job. I admire the profession and do my best, as a driver in a small passenger vehicle, to not drive like a jerk when I’m around semi-trucks. Their job on the road is hard. Mine's easy. But none of those things I admire made me buy American Truck Simulator. Sure, “American” got my attention more than Euro Truck Simulator did. I never liked Europe’s truck designs and I wasn’t itching to pull a tractor-trailer through France, Austria, or anywhere else on that side of the Atlantic. 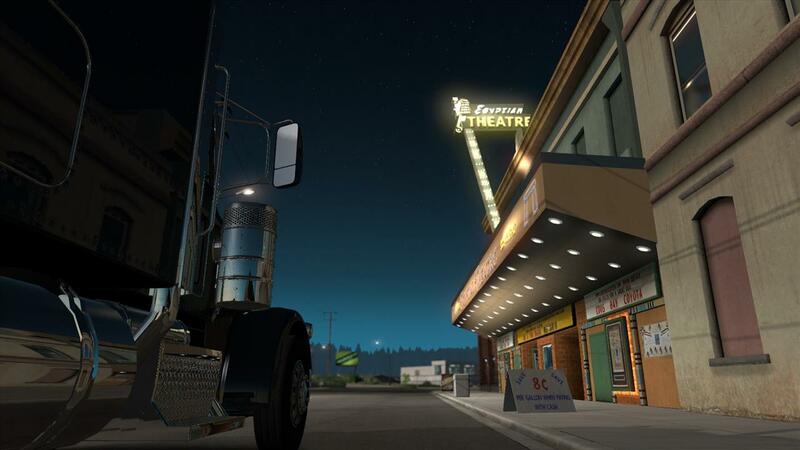 Even when it came to American Truck Simulator, I didn’t bite when they wheeled out California. Or Arizona. Or New Mexico. Or Nevada. But when they announced Oregon DLC? Hooboy. The prospect of pushing 10 gears and 18 wheels up and down the I-5 corridor in the Rogue Valley or following one of the twisty highways to the coast to visit my old stomping grounds in Coos Bay? Yes, I'd like to do that. Coursing over the high-desert landscapes of Eastern Oregon or driving through the rain and wind of the Columbia River Gorge outside of Portland? Yes, sir. And navigating old logging roads up in the hills around Medford and parking in an approximation of an old plywood mill I used to work at? Give it to me. The state is compressed. Thankfully. That’s how I can haul a trailer from the top of the state to the bottom in 45 minutes—rather than have it take seven hours. But that also means sacrifices had to be made when carving up the state. I was ecstatic to find Timber Products Co. in Medford (the plywood mill I'd worked at in the administration building). But in-game it’s stripped down, turned sideways, and sorta kinda depicted in a different part of town than it is in real life. That’s all part of the the selective butchering required when the developers made the game a compressed version of America, not a 1:1 reconstruction. So I get it. 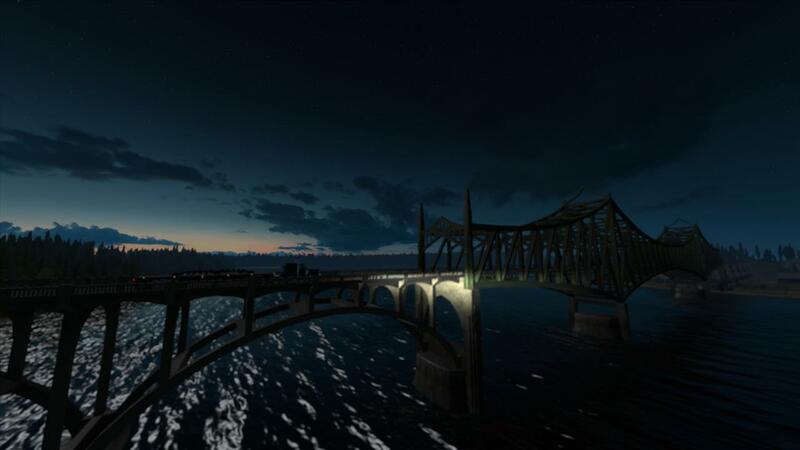 But for those same vaguely unnecessary reasons, I was underwhelmed by the game’s misshapen representation of the McCullough Memorial Bridge on the coast, too. I grew up in North Bend and Coos Bay. The two towns are small but grew together. The McCullough Memorial Bridge is a mile long and is the town’s pride and joy. It's the subject of many a postcard and Oregon Coast calendar. 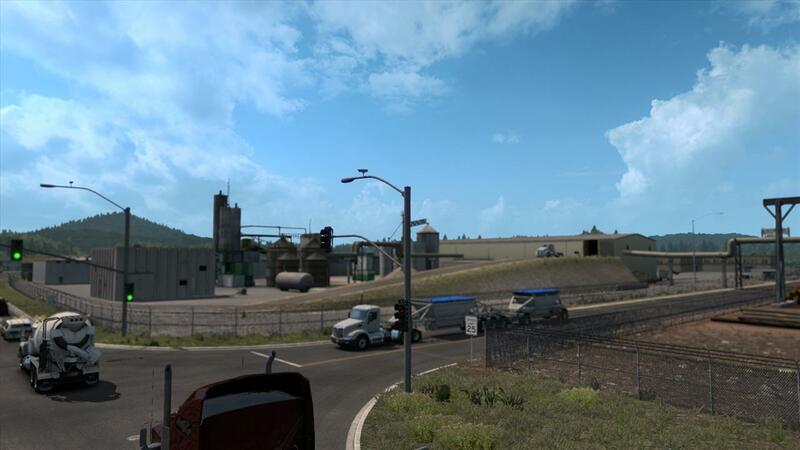 To my hometown mind, American Truck Simulator did just okay in its depiction. I do give them credit for including the 1920's Egyptian Theatre, though they must've worked from ugly photos of when it was between jobs; between being a conventional movie theater and then returned to its historical roots as a stage theater. The facade was upgraded four years ago. But in-game, the theater’s reader board is advertising Coos Bay “Coyota” for some reason, and there’s an A-frame sign on the sidewalk talking about saving $0.08 per gallon when paying with cash. It’s possible the developers read my town's Wikipedia page, got confused, and thought the Egyptian Theatre was a Broadway-looking service station somehow missing its fuel pumps. 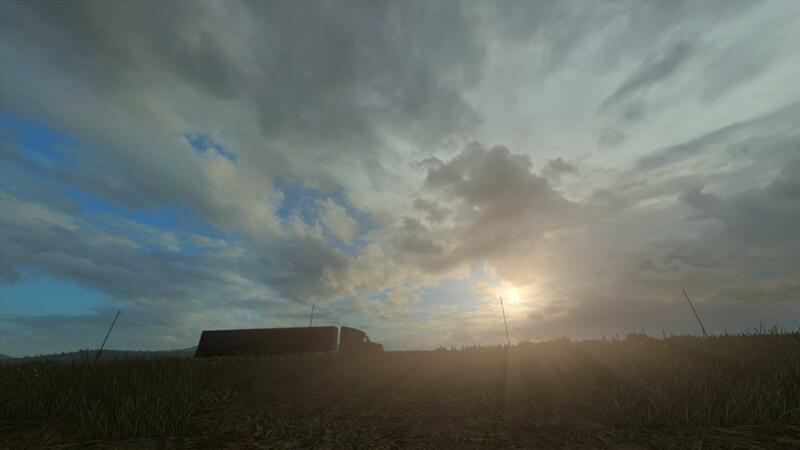 Nevertheless, the Gaming Nexus staffers had to hear me gush about American Truck Simulator–Oregon for a while in our Slack channel. I wouldn’t shut up about it. Kept posting screenshots. Kept talking about how, “I’ve got trucker blood in my veins because of my grandpappy.” Stuff like that. But that’s because location matters in video games. Crafting a setting that isn’t just a setting but a world. That matters. Yes, I pack my wife and kid into the car once in awhile and make the drive from Medford to Coos Bay to visit my mom and dad. It sounds silly to get all giddy about a video game that lets you drive places you can already drive to in real life. And it sounds silly to rave about recognizable locations, even if they’re all tossed into an Uncanny Valley since the developers were, admittedly, making a video game, not building a 3D version of Google Maps. Still, they did alright for a company based in the Czech Republic. It's asking a lot to have video game developers in Prague know the intimate details of my hometown that I grew up with. I drove across that McCullough Memorial Bridge everyday in high school, getting to and from the "Home of the Bulldogs," getting to and from problematic girlfriends and good pizza dates, and getting to and from my nerd-goth D&D buddies being shushed in the public library. It's only fair for me to politely mask my disappointment if the devs took a hacksaw to the plywood mill where I learned how to run supply chains that eventually landed a job at the city fire department. And am I being picky if I didn't see the Oregon Dunes anywhere along the coast in-game, even if they're literally what inspired Frank Herbert to write Dune? You can't have everything, I suppose. In the end, it didn't matter what was missing. What was actually there was what mattered more. 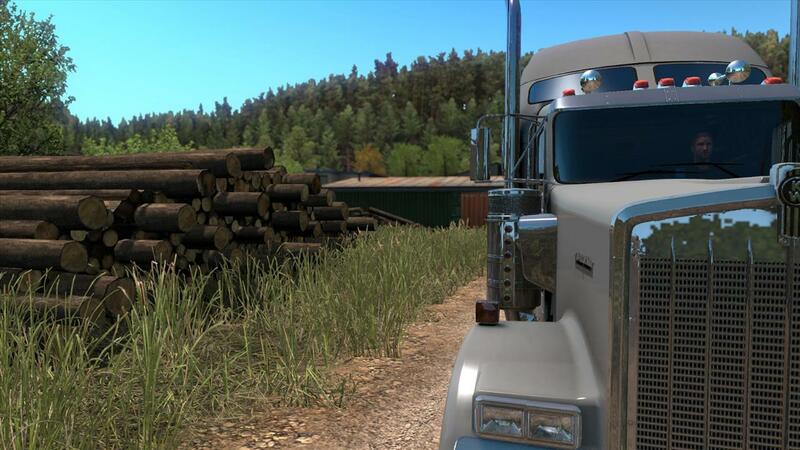 You're an American trucker in American Truck Simulator, have no doubt. But you aren’t the main character. In this case, the main character isn’t who you are, it’s where you are. And my heart is in Oregon.